I just finished watching Reality Bites which resulted in flashbacks to 15-year-old Katie. She was a funny teenager. Frizzy, home permed hair dyed a deep red. 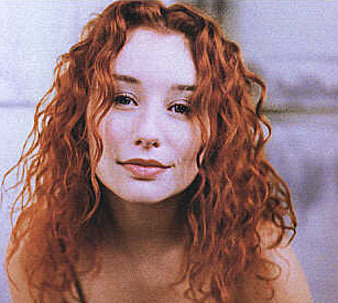 Huge Tori Amos fan. Doc Martin wearing. Social cigarette smoking. Angsty poem writer. 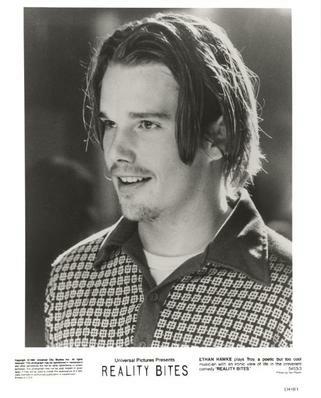 Lover of Ethan Hawke. I still love Ethan, but watching Reality Bites tonight really made me see how my tastes have changed. When I was 15, I adored Troy Dyer Ethan. His long hair and scruffy facial stylings (what would you call that attempt at facial hair?). I loved all the deep crap he spouted. His band’s name was oh so clever and I really was dying to have a “you, me and five bucks” moment with him (that would of course end in a hot pash). Now I look at the character of Troy Dyer and I am utterly repulsed. He is a massive slacker. Too cool for school. His moustache looks like an extra set of eyebrows. He talks non-stop existential crap so that he can avoid his dismal reality. The constant drinking of coffee and smoking of cigarettes just makes me think of how awful he would smell. That greasy, long hair repulses me. I actually shuddered each time he dragged his fingers through it. But most of all, I remembered dating a few guys like him back in uni and they were utter TOSSERS. But it isn’t really that surprising, I guess. It has been 17 years. 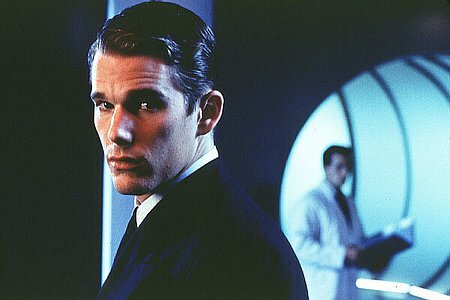 I caught the last 15 minutes of Gattaca tonight, also (must have been some Ethan Hawke movie thing going on?). I really dig Vincent/Jerome Ethan. He is flawless (well, his externals are….the whole movie is about his flawed genetics, really. But that is matter for a more serious blog post). His beautiful shiny, short hair. The tailored suits. Clean shaven…. I never though of myself of having a “type”, but I guess I do as my husband most definitely has short shiny hair, wears tailored suits and is clean-shaven at all times. Wow. I’ve come a long way since I was 15. Gosh. Funny watching movies that were the MAKING of your teen years when you’re in your thirties. Kinda makes you realise you do actually change a bit as you get older.